1814 At age 11, Ralph Waldo Emerson comes to live with his grandparents at the Old Manse during the War of 1812. 1817 Henry David Thoreau born in Concord on July 12. 1820-1830 1828 Thoreau enters Concord Academy. 1830-1840 1832 September 9. Emerson preaches the sermon that ends his career as a minister at the Second Church of Boston, saying that he was no longer "prepared to eat or drink religiously." Emerson sets sail for Malta on Christmas Day; he travels to Syracuse, Palermo, Venice, France, England, and Scotland, returning in September. 1833 Henry David Thoreau enters Harvard as a 16-year-old freshman. 1835 A few years after the death of his first wife, Ellen Tucker Emerson, Emerson marries Lydia Jackson of Plymouth and moves into the house on Cambridge Turnpike, his home for the rest of his life. 1837 Emerson's "Concord Hymn" sung at dedication of battle monument at Old North Bridge. 1838 Thoreau and his brother John found the private Concord Academy school. 1839 After Alcott admits an African American student to his Temple School, white parents withdraw their children, and the school closes for good on June 22. 1839-40 Hawthorne works as a salt and coal measurer at the Boston Custom House. 1840 The Alcotts move to Concord and settle in Hosmer Cottage. Alcott takes up farming by day and writes at night. - Margaret Fuller and Emerson collaborate to publish the first issue of the Transcendental journal, The Dial. The first issue is published in July and includes several of Alcott's high-minded "Orphic Sayings," which are ridiculed as "a train of fifteen passenger cars with one passenger" (Matteson 94). 1841 Hawthorne spends several months at Brook Farm, a communal society near Boston. In 1841, he also publishes Grandfather's Chair, a child's history of colonial New England. Emerson publishes Essays: First Series. 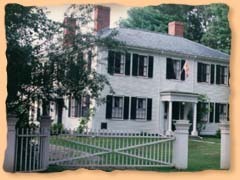 1842 After their marriage in July 1842, Nathaniel Hawthorne and his bride Sophia Peabody rent the Old Manse, the former home of Emerson's grandfather. They spend three happy years here. 1842 January. Thoreau's brother John dies of lockjaw and Emerson's 6-year-old son Waldo dies of scarlatina. 1843 January. Bronson Alcott is jailed for refusing to pay his poll tax, an action that anticipates Thoreau's more famous stay in the Concord jail in July 1846. May. Charles Lane invests $1800 in a 90-acre farm near Harvard, Massachusetts, about 14 miles from Concord. On June 1, Lane and the Alcotts move to this farm, naming it Fruitlands, to begin an experiment in communal living. The Fruitlands experiment ends in January 1844 when Lane and his son leave to join the Shakers and Bronson Alcott falls ill. The Alcotts live quietly for a time in Still River before moving back to Edmund Hosmer's farmhouse in Concord. 1844 Emerson purchases "a wood lot by Walden Pond;" the Fitchburg Railroad lays tracks along Walden Pond and into Concord. June 5. 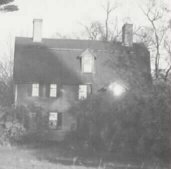 Hawthorne's Mosses from an Old Manse is entered for copyright; in the fall, Hawthorne, living in Salem at the time, brings suit to try to recoup his original investment in Brook Farm. 1846 Concord's Anti-Slavery society with Emerson and Thoreau in attendance meet on the doorstep of Thoreau's cabin in Walden. - Hawthorne's collection of short stories, Mosses from an Old Manse, is published; Hawthorne is named the Surveyor of the Port of Salem, an experience he will later describe in "The Custom House," his long introduction to The Scarlet Letter. 1848 November 17. Pressed for money, the Alcott family moves back to Boston, to various cramped apartments on Dedham Street, Groton Street, and High Street. 1850 On July 19, together with her husband, Gabriel Ossoli, and their infant son, Margaret Fuller is drowned in a shipwreck off Fire Island on the south side of Long Island, New York. 1851 May 3. Emerson delivers a powerful speech on the Fugitive Slave Law to the citizens of Concord. It says, in part: "An immoral law makes it a man's duty to break it . . . . Let us respect the Union to all honest ends. But also respect an older and a wider union, the law of Nature and rectitude. . . .[The Fugitive Slave Law must be] wiped out of the statute-book; but whilst it stands there, it must be disobeyed." 1852 June 5. The Hawthornes, after sojourns in Salem and Lenox, Massachusetts, return to Concord, purchasing the Alcotts' home and renaming it The Wayside. While in Lenox, Hawthorne frequently visited Herman Melville, who lived at Arrowhead near Pittsfield at that time. 1854 Thoreau publishes Walden; it puts the Concord woods on the world map. Louisa May Alcott publishes Flower Fables, a book of stories that she dedicates to Ellen Emerson, her audience for the tales. 1856 Bronson Alcott and Thoreau travel to New York and Brooklyn. They hear Henry Ward Beecher preach on November 9, and on November 10, Alcott introduces Thoreau to Walt Whitman. According to Matteson, "Whitman was surprised at Throeau's indifference to current political events. Thoreau was taken aback by the sensuality of Whitman's conversation; he felt as if he were interviewing an animal" (229). 1857 The Alcotts, after some years in Walpole, Connecticut, and Boston, return again to Concord. They purchase the John Moore house, which is located next to the Hawthornes' Wayside, in September and rename it "Orchard House." During repairs to Orchard House in the spring of 1858, they move into Wayside while the Hawthorne family is abroad. 1859 Bronson Alcott is appointed superintendent of the Concord schools. The Wayside, former home of the Alcotts (Hillside) and home of the Hawthorne family. The third-floor addition visible in the picture was added by Hawthorne as a study and writing room. Photograph courtesy of the American Memory Home Page. Orchard House, or, as Louisa May Alcott called it, "Apple Slump"
1860 May 23. Anna Alcott, Louisa's sister, marries John Pratt on Abba and Bronson Alcott's 30th wedding anniversary. Thoreau attends the ceremony, as does Emerson, of whom Louisa May Alcott writes in her journal: "Mr. Emerson kissed [the bride]; and I thought the honor would make even matrimony endurable, for he is the god of my idolatry." 1862 Thoreau dies of tuberculosis on May 6. Bronson Alcott dismisses the schools and hundreds attend Thoreau's interment at Sleepy Hollow Cemetery. Note: According to Thoreau research Austin Meredith, the Authors' Ridge section where Thoreau is buried is a later addition to the cemetery, and his original gravestone has been lost. 1864 Hawthorne dies while visiting Plymouth on May 19 and is buried near Thoreau. Mid-1860s. The future philosopher William James and future novelist Henry James live at Emerson's house (see below) while attending Frank Sanborn's academy. Emerson is William's godfather, and their classmates include Edward Emerson and Julian Hawthorne. 1868 Louisa May Alcott writes her most famous novel, Little Women, at Orchard House; Part I is published on 1 October. 1870-1880 1872 Bronson Alcott begins a cairn of stones at the Walden cabin site. July 24. Emerson's house burns, but the Alcott daughters help rescue the manuscripts as a shattered Emerson later goes abroad, leaving New York on October 23. 1873 Emerson, 70, returns to Concord to find his home and library have been restored by his neighbors. 1877 The Alcotts purchase the Thoreau House and move in on 14 November. Orchard House is closed. 1879 Bronson Alcott establishes the Concord School of Philosophy for adult education. The photograph shows Alcott on the steps of his school. 1882 Emerson dies on April 27; he is buried in Sleepy Hollow Cemetery. 1888 Bronson Alcott dies in Boston on March 4; Louisa May dies two days later on March 6 and is buried in the family plot in Concord's Sleepy Hollow Cemetery. Basic information courtesy of I Hear American Singing; additional information added by site author. See especially Carlos Baker's Emerson Among the Eccentrics and Robert D. Richardson's Emerson: The Mind on Fire. .